Lucy Diamond, author of The House of New Beginnings, on the joy of making a new friend when you least expect it. In a few days, I’m off for a hen weekend with some of my oldest, dearest friends. Sadly, geography means that we don’t see one another as often as I’d like any more – years can go by between catch-ups – but whenever we do meet, we seem to catapult straight back to that easy-going, tell-me-EVERYTHING connection, as if nothing has changed. Old friends are the best, right? Everyone loves their oldest friends. But I’d like to shake a few pom-poms for new friends too. For the friends who come along just when you seem to need them most, and who make your life that extra bit sparklier. Like the characters in The House of New Beginnings, I’ve started over in a new place many times. I moved to London after graduating because a friend had a room going in a flat-share and it sounded like a laugh. I moved to Oxford because I was offered a job there, and I’m a sucker for a beautiful city. I moved to Brighton, lured in by a lifelong dream of having a home by the sea. And I moved to Bath in order to be closer to my extended family. Each time, the move has been a leap of faith, a roll of the dice and a whole new beginning. For most of them, I didn’t know a single other person within the city, let alone anyone I could call a friend. I’m not going to pretend: every time I’ve done this, it’s been hard at first. However exciting a new start can seem on paper, it’s daunting too, especially if you move into a community where everyone else seems to know each other, when there are cliques and in-jokes of which you are not a part. I’ve felt lonely and even shy on occasion, plucking up the courage to make conversation with a complete stranger and hoping all the while that my eyes aren’t flashing Like me! Please like me! in desperation. But thankfully we humans tend, by nature, to be a gregarious bunch – and I’m glad to say that there have been fantastic, funny, kind, excellent women in every place I’ve moved to, who have proved to be unfailingly generous with their friendship. The woman I met in a sunny Brighton playground, my newborn son strapped to my chest, my one-year-old daughter in the swing – that woman who said, 'It’s tough, isn’t it, having two kids close together. Here’s my number if you ever fancy meeting up and screaming' – she became a friend. Another woman who, on the day we moved to Bath, appeared with a bottle of wine and presents for all my children, and said, 'Brilliant, a new family next door, come over any time' – she became a friend. And the twinkly-eyed, mischievous-seeming woman I’ve chatted to a few times walking my dog recently – I’ve got a feeling she’s going to be a friend too. It’s all good. I can’t wait to see my old friends again… but there’s something wonderful about getting to know a brand new friend too, especially when we least expect it. I hope that The House of New Beginnings captures that sense of possibility, a feeling of optimism when it comes to the kindness of strangers and above all, the sheer joy of a new friendship... and where it might lead . . . 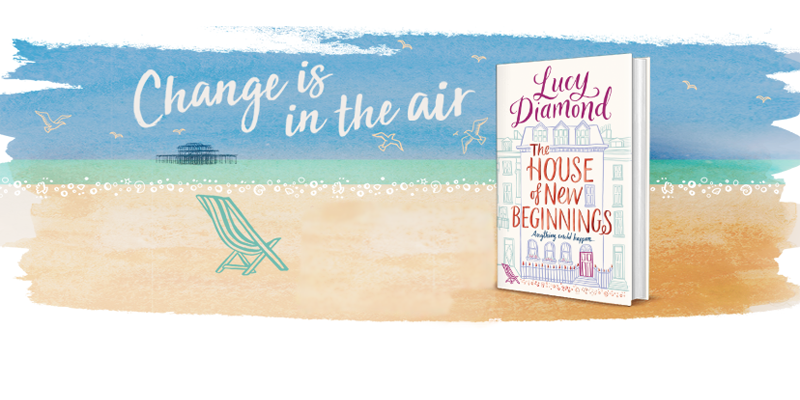 The fantastic new novel from the bestselling author of The Secrets of Happiness and Summer at Shell Cottage, follows three women, Georgie, Charlotte and Rosa, who are thrown together as tenants of a house on Brighton’s seafront where they are all looking to make a new start. A novel all about fun, friendship and fresh starts.